We are delighted to announce that as part of the Outer North summer scheme 2017 we will be teaming up with The Greater Shantallow Area Partnership and County Derry GAA to introduce a series of summer community games. 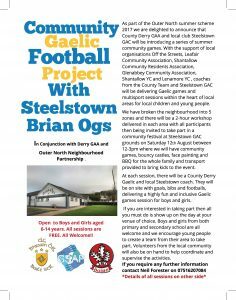 With the support of local youth organisations Off the Streets, Leafair Community Association and Shantallow Community Residents coaches from the County Team and we will be helping to deliver Gaelic games and multisport sessions within the heart of local areas for local children and young people. The neighbourhood has been broken into 5 zones and there will be a 2-hour workshop delivered in each area with all participants then being invited to take part in a community festival at our club grounds on Saturday 12th August between 12-3pm where we will have community games, bouncy castles, face painting and BBQ for the whole family and transport provided to bring kids to the event. 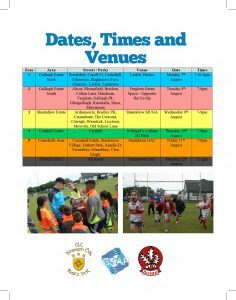 At each session, there will be a County Derry Gaelic and as well as our own coaches. They will be on site with goals, bibs and footballs, delivering a highly fun and inclusive Gaelic games session for boys and girls. This will teach them the basics of the sport enabling them to learn new skills and play in small sided games. This will be open for boys and girls aged 6-14 years. If you are interested in taking part then all you must do is show up on the day at your venue of choice. Boys and girls from both primary and secondary school are all welcome and we encourage young people to create a team from their area to take part. Volunteers from the local community will also be on hand to help coordinate and supervise the activities. This event is open to all and is FREE of charge. Copyright © 2016 Steelstown Brian Ogs. All Rights Reserved. 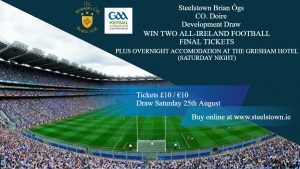 WIN Two All-Ireland Football Final Tickets!!! + an overnight stay at the Gresham Hotel Dublin!